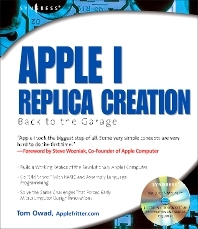 The perfect book for computer hobbyists, Apple I Replica Creation: Back to the Garage is sure to equally appeal both to kids with gift certificates looking for fun on a snowy January day as well as to adults eager to learn the basics of simple microcomputer design. The book will begin by teaching readers the basics of computer processing by discussing the functionality of the 9 chip on the Apple I motherboard. From there, readers will be taught the basics of memory access and video input and output. Readers then learn how to assemble the various hardware components into a fully functioning Apple I replica. Finally, readers will learn how to write their own applications to take run on their new/old computer. *Written by the webmaster of AppleFritter.com, which is the most popular Mac hobbyist Web site on the internet with over 10,000 visitors a day. *Interest in vintage Apple I Computers is extremely high, with original machines selling for as much as $50,000.